I got my Tea For One as part of an online promotion that DavidsTea was having (spend $75 or more and receive a free Tea For One), so I received this in the mail. The packaging is quite sturdy – it comes in a nice cube box that has some details about the product on either side in English and French. 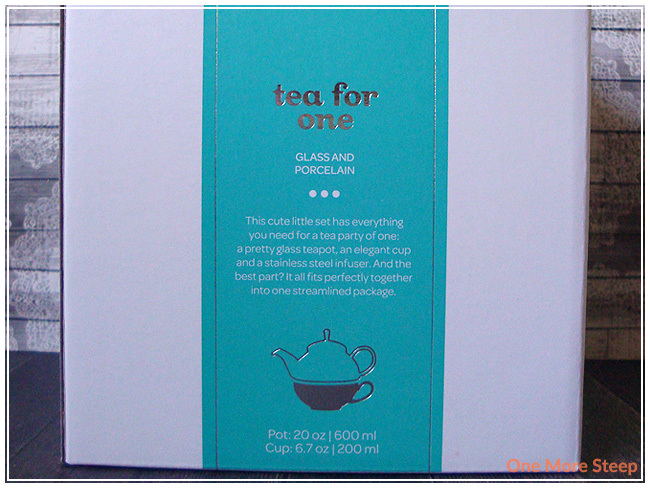 The DavidsTea website claims that the cup is ceramic in the title of the product, but in the description it is porcelain, while the packaging states that it is porcelain – ceramic and porcelain are not the same thing! Both are made of clay and fired in a kiln, but porcelain is more refined clay. The majority of the descriptions state porcelain, so I’m going to assume it is actually made of porcelain. 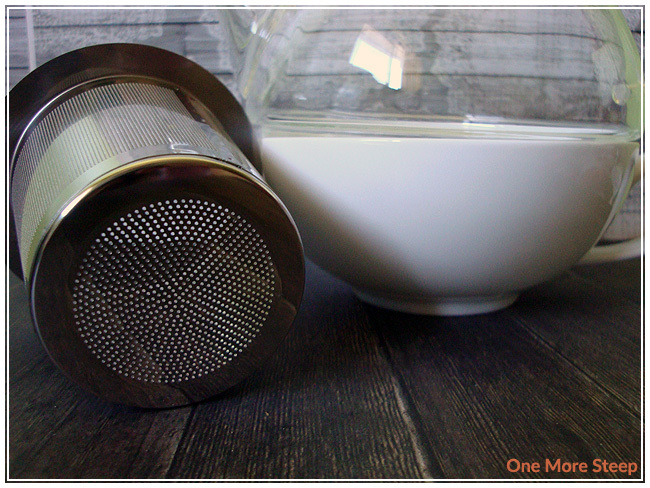 The infuser is stainless steel. The tea pot holds 600ml (20oz) and the cup holds 200ml (6.7oz), which is a fairly decent amount. I find that the tea pot doesn’t sit well in the cup because it can rock. But the material feels sturdy, I’m sure it’d break if dropped, but it has nice smooth edges on all the parts that you can touch. Prior to using my Tea For One, I hand washed it in warm soapy water. The bottom of the tea cup states that it is microwave and dishwasher safe. There are no markings on the glass tea pot or stainless steel infuser. Because of the delicate nature of the product, I would opt to hand wash it always anyways. I used my Tea For One when I was steeping some oolong (review coming soon!). There was exactly one little piece of tea leaf that escaped the stainless steel infuser on all five of the steepings that I did, I feel that the infuser did a really good job overall. The stainless steel infuser itself does not have a little tab to remove it with, but I find that the edges extend just enough that I can remove it and it did not burn my fingers. The tea pot itself does get hot (it is not double-walled), but the handle remains cool to the touch. The stem of the tea pot lid remains cool, there’s a small hole for venting in the lid as well. 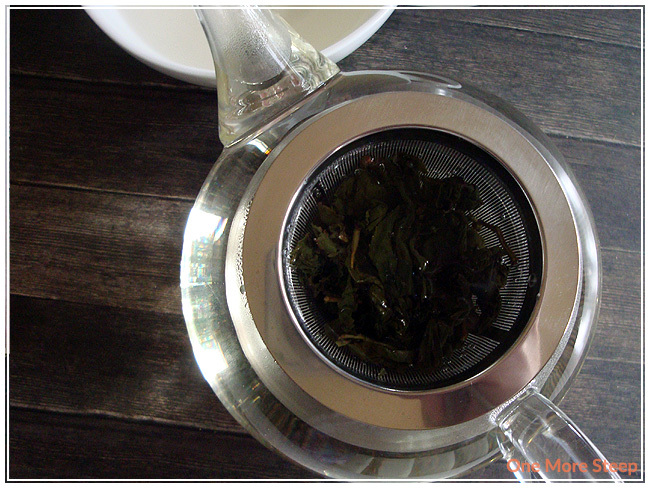 The lid of the tea pot does sit nicely in the tea pot with and without the infuser in place. I love the DavidsTea’s Tea For One. I think that it’s very cute and functions well. While I wish that the tea pot and tea cup fit better together when stacked, I don’t think it matters to me that much that I would rate the product lower. I like the fact that the infuser does have holes on the bottom, and it did a fantastic job of keeping tea leaves out of my cup of tea. I think that DavidsTea could do a better job in the description of the product (ceramic, porcelain), but the fact that the product comes in sturdy packaging and functions as promised does help a lot. 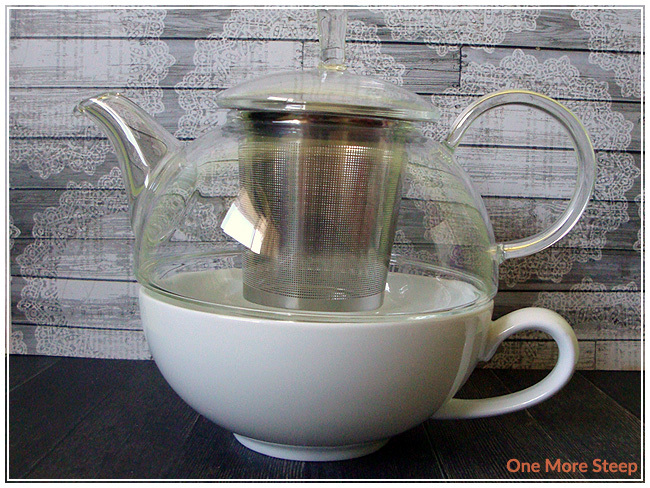 I think it is good value for $25.00 and it makes for a more enjoyable tea experience and for better solo tea parties.